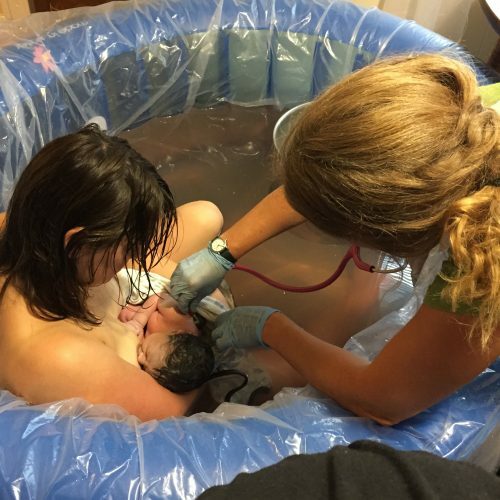 Brookhaven has two Gentle Birth Pool kits available for families having a homebirth and wanting to have water available to ease the discomfort of labor and/or have a waterbirth. Clients of other midwives are welcome to rent our pools, you do not have to be a Brookhaven client to rent from us. Our clients do receive a substantial discount though! The Gentle Birth Pool is manufactured by Waterbirth International was developed by two waterbirth parents who wanted something lightweight and portable for their next birth. The pool can easily be moved from room to room (when empty), and setup takes little time. Unpack the pool, put it together, fill with water and you are ready to welcome your child into the world! We provide all of the equipment you need for a warm, gentle waterbirth. To reserve your pool contact Brookhaven and send in your $50 deposit. Full payment is due by your 37th week of pregnancy or upon delivery of the pool kit, whichever comes first. The pool should be obtained by the end of your 37th week of pregnancy. There is no extra charge if your baby decides to wait until 42 weeks to arrive. Please watch the following video in its entirety PRIOR to the 36 week trial set-up. This is trial set-up is imperative to ensure that no parts are missing, to test the capacity of the hot water heater, and also for peace of mind before the big day!